"I guess, just like the Muslims appropriated much of the Jewish Bible, the Old Testament...or (uh) rather GOD appropriated it for Islam, it looks like Muslims are going to follow the lead of Jews in the U.S. thanks to the template (uh) set out by Professor Broyde. Secondly, due to that template that he set out, it seems to me that the fears of many people about the incursion of Sharia are not properly directed at the Muslims who have little interest or idea how to go about it. 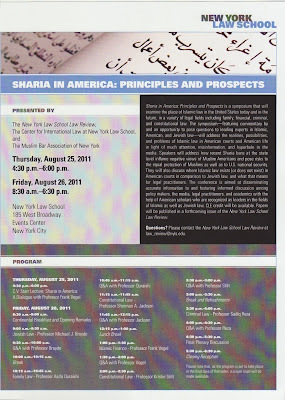 But rather at Professor Broyde who seems to know exactly how to (unclear word) and is telling Muslims how to...."
This was an 8 hour Symposium at NY Law School Law Review on "Sharia in America:Principle and Prospects". 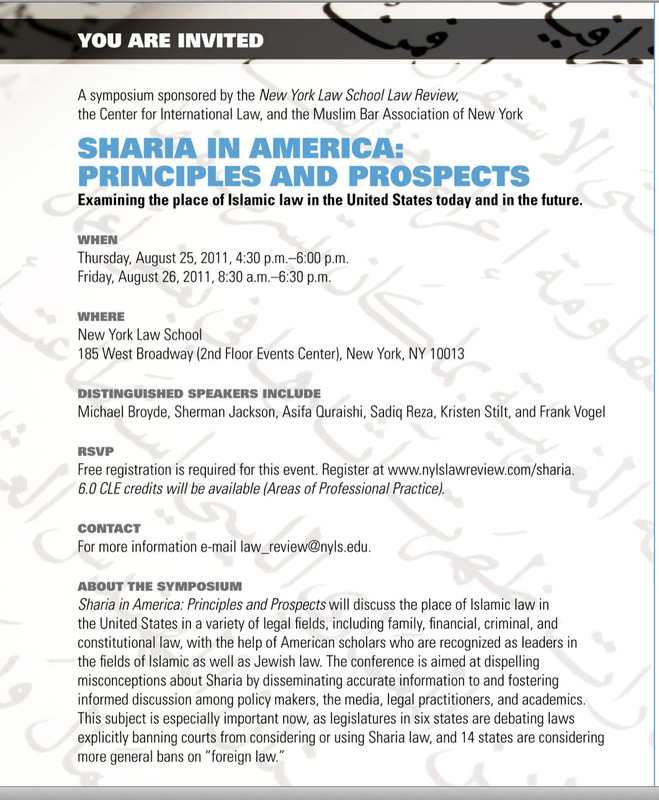 The purpose was to examine the place of Islamic Law in The United States. After the introductory remarks by Professor Sadiq Reza, we heard from Professor Michael Broyde (Emory University School of Law) on Jewish Law. He spoke for 25 minutes then took questions from audience. 6. 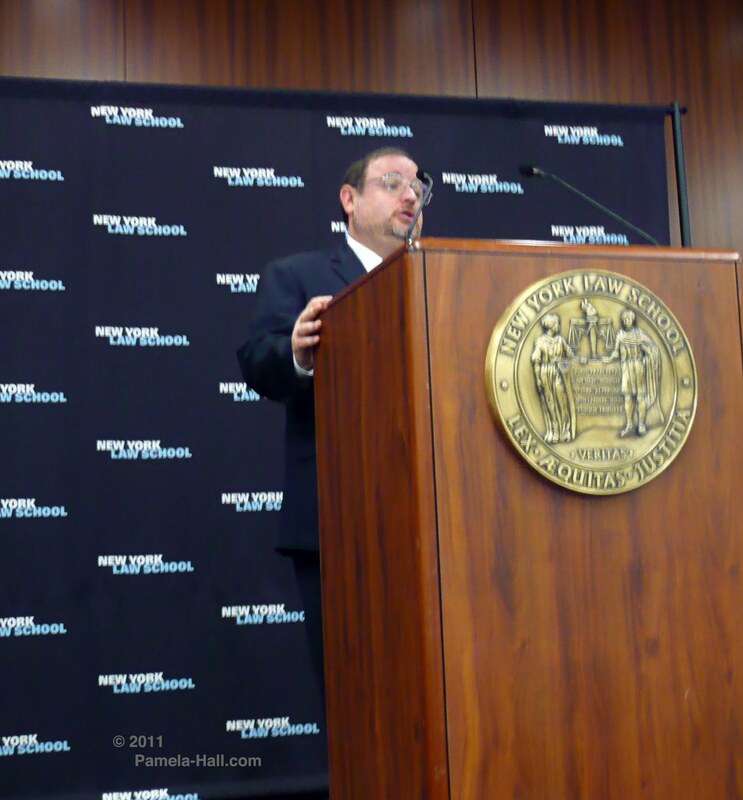 The overlap of Jewish and American Law. 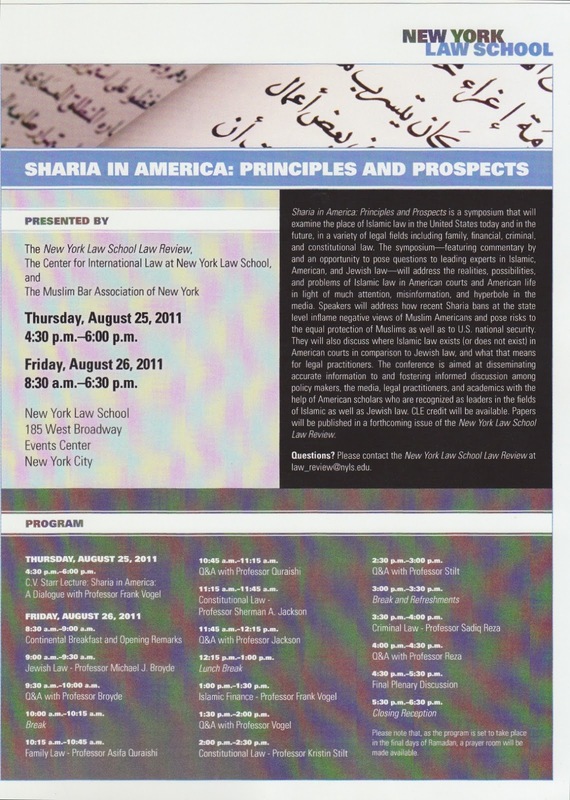 He suggests to the Sharia Law proponents,"Make the same mistakes we did." 10. panels need to be lawyers. 1. Jewish Law is cheap and accurate (and fast). Islamic Court might do likewise. 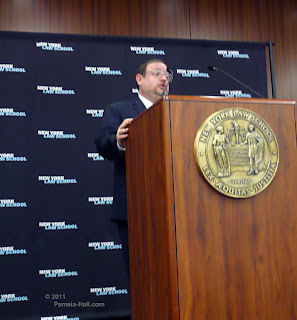 AUDIO of Professor Broyde's 25 minute speech. The Audience Q and A continues til 50:00 followed by closing Professor Sadiq Reza's closing remarks. 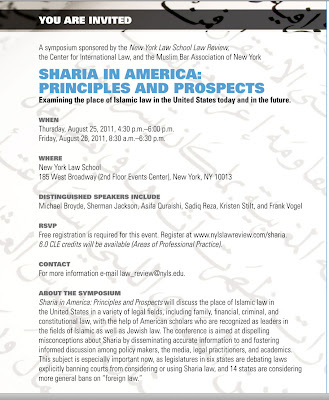 Parts 4 and 5 continue with Professor Mohammad Fadel ( Islamic Constitution and "Interaction" Theory) AND please follow link below to a fabulous article on the symposium written by Alyssa Lappen "Sharia Lobby Shifts into Fifth Gear"